Atlas Terminals is an HO scale, 576 sq in, micro layout based on an industrial facility in Glendale, Queens, New York. The siding on the north side of LIRR’s Montauk Branch serves as interchange (staging) track from which the Trackmobile delivers cars into the terminal or makes set-outs for pick-up. 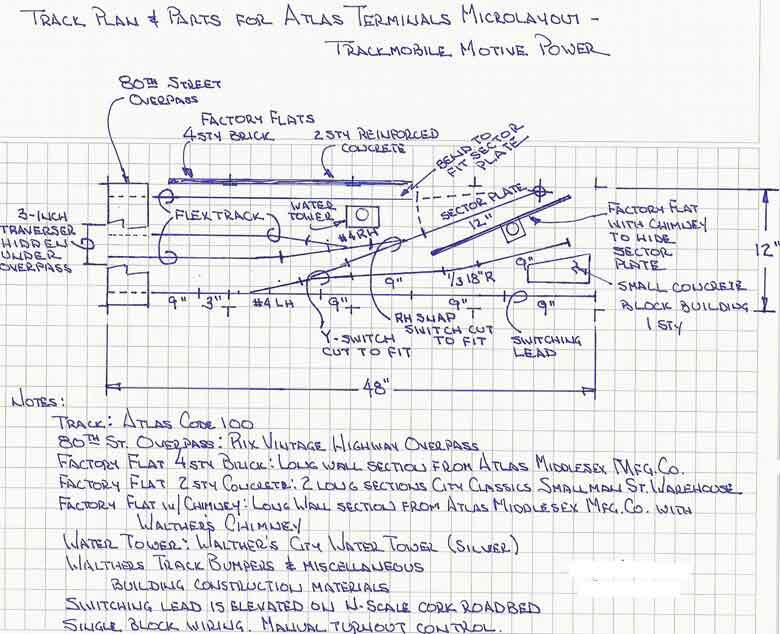 The switching lead before the turnout into Atlas Terminals and sector plate are sized for a Trackmobile and 60-foot car should one ever be set-out. The Trackmobile must have operating couplers on both ends. Interchange track capacity is four 40-foot cars; warehouse track capacity is five 40-foot cars. Traverser (hidden under 80th Street Overpass) capacity is the Trackmobile to release it to run around cars for warehouse delivery. Tracks serving the traverser can be used as team tracks. Atlas Terminals (here and here) landmarks are the water tower (still a Glendale landmark), smoke stack, and 4-story brick factory refurbished for the shopping center now occupying the site. Structures are Atlas, City Classics, Walthers, and Rix. Track is Atlas code 100. The wye turnout and RH Snap Switch are cut to fit. Track plan and a mock-up picture with 50-ft. cars, attached. My interest in Atlas Terminals: I grew up in Queens and passed it whenever my family visited friends in Glendale. The terminal used small industrial locomotives for switching, one preserved until recently at the site. Should the facility have survived as a terminal, my bet is it would use Trackmobiles.